In many workplaces, Personal Protective Equipment (PPE) is used, either as the only form of protection or as an additional line of protection to supplement other approaches. Few health and safety professionals would argue against using other precautions, aimed at preventing hazards or reducing risks at source, as first choice. Those professionals would, however, readily admit that such measures will seldom completely remove a risk and that PPE will continue to have a role to play in occupational safety and health. The selection of PPE can be a complex process, especially for respiratory protection (RPE) where the choices available are sometimes overwhelming. But is it important to get it right. This article provides a brief overview of some of the technical and ergonomic issues relating to the selection of PPE. It also discusses a further problem – that of counterfeit PPE. It appears that all is not what it seems in the world of PPE. Does it provide the right level of protection? For those forms of PPE where several classes of protection are available it is important to select the right level of protection for the risk involved. RPE must be selected to provide the right type of protection (dusts or vapours and gases need different forms of filter) and the right level of protection (high levels of a substance will need a higher performance filter). If the RPE doesn’t have a high enough ‘protection factor’ then it will be unlikely to filter out all (or at least most) of the offending substance and the wearer will still be at risk. Don’t, however, fall into the trap of thinking that you will play safe by providing a higher level of protection than is really necessary. In many cases, that higher protection comes at a price – both literally (they tend to be more expensive) and metaphorically. Higher performing RPE might be bigger, heavier and have a higher breathing resistance – all factors which can make your workers more reluctant to wear it. It almost goes without saying that if they don’t wear it, or don’t fit it properly in an effort to make it easier to wear, then they won’t be getting the necessary protection, even with a higher performance mask. Similarly, hearing protection must be chosen with reference to the sound levels in the workplace. It is important to take the noise levels and frequencies into account in carefully selecting the right hearing defenders for the job. Again, overprotection should be avoided as, apart from possibly increasing feelings of isolation, defenders providing higher levels of protection tend to be bulkier and heavier – factors which have been shown to be more likely to discourage wearing. Similar considerations apply to eye protection. What are you protecting against? Not all ‘safety glasses’ are the same, and impact protection, protection from dusts and protection from sprays all need different features. Fortunately, in choosing the right type and level of protection against a particular hazard, technical standards exist to help you through what would otherwise be a potential minefield. Otherwise how would you know what was the right PPE to provide a particular level of protection? Within Europe a system of CEN standards (the European Committee for Standardisation – the initials come from its French title, Comité Européen de Normalisation) ensures that all PPE is tested to comply with minimum specified levels of protection – as well as other characteristics. Similar sets of standards apply in the USA and other parts of the world. When getting it right for the wearer, size (can) matter. With some forms of PPE, having the right size, correctly fitting the wearer, can be crucial for ensuring the correct level of protection. With RPE, fit is critical, and the requirement in the UK for Face-Fit testing recognises that without a correct fit, the necessary technical performance will not be achieved. Although all are made to pass the same technical standard, RPE from different manufacturers can differ in shape and it is important to realise that one size probably doesn’t fit all when it comes to RPE. Again, where getting a fit is a particular problem, hood-type RPE can be an alternative. Even hearing defenders and ear plugs can differ in size and shape and again, different makes might be better for some wearers than others – after all, we all come in different shapes and sizes as well. Look around in your workplace if you need convincing. Even with something as simple as a hard hat, having the right size shell can be important in ensuring the correct air space inside; helping to improve acceptability; and making sure it is stable on the wearer’s head. Why do a high proportion of workers exposed to potential respiratory hazards not wear their RPE? There are many factors that contribute to this, which relate to the ergonomics of RPE/PPE design and use. Firstly, as well as being technically effective, PPE must not be too uncomfortable to wear, and must not get in the way of doing the work, or it will not be worn correctly (if at all). For example, when a wearer is working hard, or if they have an existing respiratory problem, even the modest increase in breathing resistance imposed by RPE can be a problem. Powered respirators, in which filtered air is blown inside a mask or hood, can help to overcome this, making the RPE more acceptable. Similarly, in noisy environments but where users still need to be able to hear certain sounds, selective hearing defenders can help, again making the PPE more acceptable. In such ways, careful selection of PPE can help to ensure that those wearing it can have the right sort of protection which is right for the tasks they have to perform. How many of us, when doing a DIY job such as fitting loft insulation, have found our glasses misting up on top of the dust respirator we are wearing? What have we done about it? Too often, the answer is to not wear one of the two properly, if at all. Where two or more items of PPE are worn at the same time, they might interfere with each other, either in terms of comfort or of performance. Helmet-mounted hearing defenders should only be worn with those makes of helmet they have been tested with (this information is available from the manufacturers). Even then, however, they might not be suitable for some people where there is too little space between the helmet shell and the ear (not between the ears) for the hearing defender shell to fit correctly and comfortably. The arms of safety glasses will pass under the cushions of hearing defenders. This might cause a break in the seal (making the defenders less effective) or be pushed against the side of the head making the two uncomfortable to wear together. Again, alternative forms of PPE can help, with ear plugs instead of hearing defenders or safety glasses with elastic straps instead of side arms. There are even styles of full-face respirator that can accommodate prescription glasses (which can again otherwise break the seal). Where glasses are a problem with RPE, some designs of hood-type RPE can also provide eye protection (but not all types, so check carefully). Well - if that’s your attitude! So far, this article has concentrated on the physical aspects of the PPE, helping to ensure that employers provide the correct PPE for the hazard; select PPE which serves their workforce correctly; and selects PPE which interferes, as little as possible, either with the work or with other forms of PPE worn. No matter how carefully chosen however, the PPE, will not be effective if it is not worn. Attention to the above factors can help. Potential wearers have to believe that the PPE will protect them, and PPE which gets in the way or is uncomfortable will be less likely to be worn. But this is unlikely to be enough. It takes commitment?and belief both from managers and from employees for an effective PPE programme. As well as physical constraints, attitudinal and behavioural factors are also important. Research has shown that managers at all levels in an organisation need firstly to recognise the need for PPE. It is important that those with management or supervisory responsibilities are aware of the hazards involved; know of the possible consequences of exposure; and recognise and accept the role which correctly selected and worn PPE can play in controlling such risks. This can particularly be the case where managers and supervisors themselves are ‘old hands’. Research has identified that older workers can provide a potential negative influence as they perhaps have a different perspective framed by prior experience and practice. Changing knowledge about workplace hazards also plays a part and older workers in particular might find it hard to accept that a particular chemical is now seen as hazardous when its use was once commonplace. Of course, having seen the effects of workplace hazards on their former workmates, they can also be a positive influence in encouraging younger workers to protect themselves. As with other workplace health and safety issues it is important for all employees, especially managers, to recognise that they have a role to play in health and safety and that their attitudes and behaviour can be a major positive (or negative) influence. Encouraging an inclusive health and safety culture, where such issues are the responsibility of all, not just a designated person, will make a valuable contribution to the subsequent effectiveness of any programme. When PPE has been selected, it must always be readily available. Some forms of PPE are relatively robust and long-lasting, such as safety helmets – although even these can deteriorate in heat or sunlight. Others, however, might be designed to be limited use (e.g. disposable RPE) or might be easily soiled and made unsuitable. For example, gloves which have been heavily contaminated by whatever they are protecting from might no longer provide suitable protection. Replacement supplies must be readily and easily available or any efforts to ensure compliance will be undermined. Intuitively, it is important that employees are made aware of the hazard and of the risks which could be associated with whatever the PPE is protecting against. In some workplaces, informing and educating is likely to be the most effective approach. There is some evidence, however, in some industries at least, that people respond better to just being told what to do. Nevertheless, some at least in the workforce are likely to respond better to a more informed approach. As well as providing information about the hazard, such training should provide an opportunity to identify and address the entrenched attitudes which engender a disproportionately low risk perception. In some instances, employees think PPE is being used as the cheap alternative to ‘proper’ protection and it is right that PPE should not be regarded as the first avenue for protection. The resultant attitude of the employers as ‘cheapskates’ is difficult to shake off – but it will help if the reasons for using PPE in preference to other approaches (or as well as other approaches) is carefully explained. While technically the risk associated with a brief exposure to a hazard during a short visit to a work area might well be negligible, failure to wear the correct PPE in such circumstances will undermine any efforts to maximise compliance.? ?For example, if a manager is seen walking through a hearing protection zone without protection, then employees are more likely to see it as an example of ‘one law for us, another law for them’, rather than working out that five minutes exposure is less of a problem than eight hours. ‘Leading by example’ might sound trite, but it is likely to be far more effective than ‘do what I say, not what I do’. Some types of PPE, such as powered respirators, require more cleaning and maintenance than others and may well require centralised provision. Examples have been encountered where, for example, powered respirators have been provided without this ancillary provision, with predictable consequences. Even less demanding types of PPE might nevertheless require some provisions to be made. For example, RPE which is only worn intermittently has often been seen left lying on workbenches or otherwise exposed to contamination when not being worn. Provision should be made for temporary storage facilities close at hand. Such provision should also include allowing time within the working day for such activities. If it left until after the end of the shift it is less likely to be carried out correctly, if at all. Many of the issues described above have parallels within the workforce. Thus, it is important that employees are made aware of the hazard involved and of the consequent risks arising. When a requirement for PPE is introduced where there has not been one previously, care should be taken to identify and counter the possible reluctance to recognise the risk, particularly among older workers. In some instances, there can be a reluctance to admit that the individual has been at risk, perhaps for many years (a concern which can also influence management attitudes) and it might therefore be seen by all as easier to continue to ignore the hazard. There are many indications that involving the workers in selecting PPE and, where possible, providing them with a degree of personal choice in which make/model of PPE to wear, helps to ensure better acceptance and compliance. Training should seek to identify and address the entrenched attitudes which engender a disproportionately low perception of risk and result in a reluctance to wear PPE. Parallels can be drawn with the attitude to smoking that says ‘my uncle smoked 80 a day and he lived until he was 90’. It is often difficult to get people to recognise or acknowledge a risk and getting them to change their behaviour as a result. Many contributory factors can be at play here, including the ‘macho’ culture described earlier. On the positive side, there is some evidence that, initially at least, younger workers are less willing to accept conditions which their seniors regard as ‘just part of the job’ and might find PPE more acceptable as a result. It is also important to recognise that the real reason for a failure to change might not be that put forward by the employees; for example someone who ‘blames’ the physical characteristics of the RPE rather than admitting to just not wanting to wear it, or an individual not wanting to admit to experiencing feelings of claustrophobia when wearing a full-face respirator. 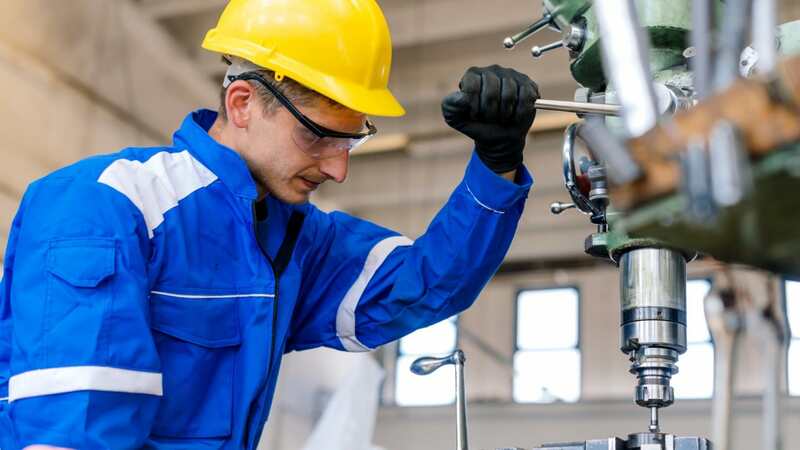 As stated earlier, even where the need for the use of PPE has been recognised and accepted, employees might still be reluctant to wear equipment which is uncomfortable or intrusive. Although worker involvement in selection will help to offset this to some extent, some employees might still find the level of discomfort from a particular form of PPE unacceptable. In some cases, this might be an unavoidable consequence of the risk being protected against. If this is the case then this should be explained to the employees so that they can appreciate that these characteristics are a necessary part of providing the protection required. In other instances, however, other approaches might be effective. For example, instead of using a relatively heavy, bulky class 3 gas/vapour filter on RPE it might be possible to use a class 1 filter, but to replace it more frequently, e.g. at breaks during the shift. It is important to recognise that this is not ‘just’ a comfort issue. If RPE is either not worn or not worn correctly, then health and ultimately the quality and duration of life can be adversely affected. You might have carefully made the right technical selection for the level and type of risk identified in a workplace and given detailed consideration to ergonomic aspects of the PPE and the conditions in which it is to be worn – possibly involving your workforce in that process. You probably think, therefore, that you have done everything you can now you have bought the necessary PPE. You have even checked that it has the necessary identifier to show it has been certified as giving the correct performance (CE mark in Europe). You have even saved your company some money by getting it for a ‘good’ price, e.g. cheaply. How would you feel, then, to discover that it wasn’t genuine, that it didn’t provide the necessary level of protection – and in fact it might not provide any protection at all? Buying a fake handbag may be illegal but it is unlikely to be life threatening. Buying illegal, non-conforming PPE, however, could be the difference between life and death – or at least ill health or disability. Non-conforming safety helmets and prescription safety glasses are regrettably only two of the types of product that are finding their way into the marketplace. Unfortunately, to the untrained and unsuspecting eye, illegal, non-conforming safety equipment is hard to distinguish and in many instances goes unnoticed until an accident occurs, often with irreversible consequences. Discovering that the cheap safety helmets you bought are fake could literally have shattering consequences. “Take note of the price of the PPE. If it appears that the cost of the item is extraordinarily cheap then there could be good reason – shoddy workmanship, poor materials, to name but a few. Another area to take into consideration is the look and feel of the product. In many instances just by carrying out a thorough inspection of the item you might be able to detect noticeable defects. Clearly, however, being sure that you are buying from a reliable and reputable source can help make this job easier. If you are still unsure, the supplier of the product should be able to provide you with an EC Declaration of Conformity or EC-Type Examination Certificate for the specific product in question. In summary, PPE should correctly be seen as the last (or temporary) resort in controlling risks from workplace hazards. There are times, however, when use of PPE is unavoidable, and essential if the health and safety of the workforce is to be protected. Ensure not only that you choose PPE which is technically right for the job, e.g. providing the correct level of protection, but that you get it from a reputable source. As the old adage goes, if it seems too good to be true – it probably is. Any PPE worn above the neck must also not be too uncomfortable to wear, and must not get in the way of doing the work, or it will not be worn correctly, if at all. Managers and supervisors have an important role to play as, unless the need for PPE is recognised in the first place, and the correct PPE chosen and made available, then worrying about fit, comfort, interference with work and all of the other factors written about will be a waste of time. Every individual worker also has a role to play - the clue is in the name: Personal Protective Equipment.